For position feedback, the F5 unit offers the ability to very simply add switches (mechanical or proximity), a potentiometer or a 4­20 mA transmitter to the P5 / EP5 base pneumatic positioner. The modular housing needs no special mounting pieces and is O-ring sealed. LED lights assist in the setting of the transmitter. The cam and spindle are not splined, so true 100% resolution is achieved ­ an important feature when used on control valves. Available as Explosion proof and Intrinsically safe. Please contact us for more information. F5 - Feedback unit, to be installed on top of P5/EP5, no cover incl. 00 - For installation on P5/EP5, no other spindle available. 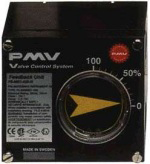 PMV P5: Modular and flexible Pneumatic positioner famous for its high reliability.